The Audéo B-R is a groundbreaking new hearing aid on Phonak’s next-generation Belong platform. When creating Belong, Phonak had a very simple aim – to simplify their customers’ lives and push the boundaries of hearing aid performance. Audéo B-R is the first-ever hearing aid to feature a lithium-ion battery, making it the quickest-charging and most powerful rechargeable hearing device on the market. It lasts an impressive 24 hours on a full charge, and offers a fast recharge time and a battery that will last as long as the hearing device itself. Audéo B-R runs on an enhanced version of Phonak’s acclaimed operating system, AutoSense OS. This automated OS intelligently adjusts the hearing aid settings to match your environment, for effortless and outstanding sound quality throughout the day. The Audéo B-R is part of Phonak’s new Audéo B portfolio, and it’s the only hearing aid in the range to feature rechargeable batteries. It is suitable for mild to severe hearing loss, and is available as a Receiver-in-canal (RIC) model at 4 performance levels. 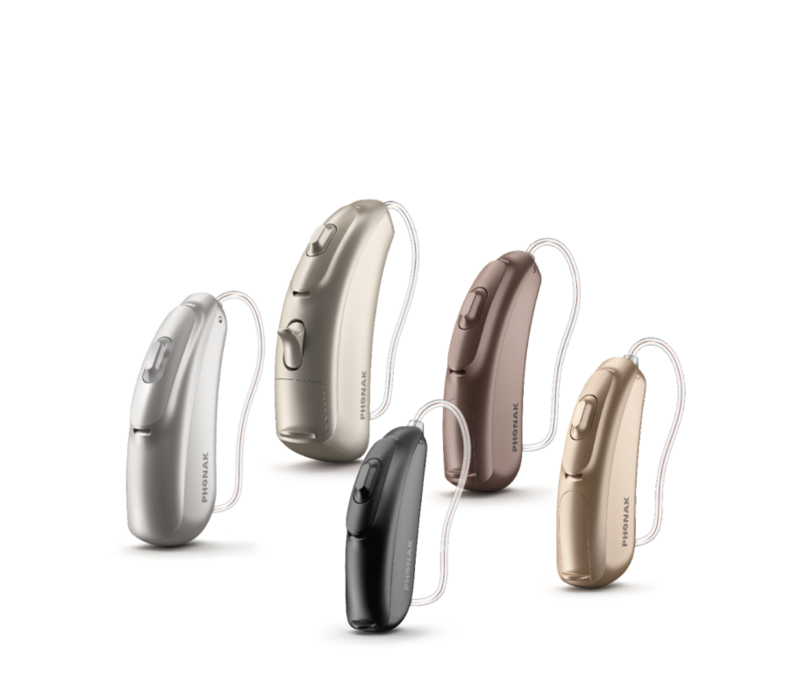 The hearing aid features a sophisticated and discreet design, with 9 different colors to choose from. It has an IP68 rating, meaning it is resistant to water and dust. Research has shown that rechargeable hearing aids top the list of features most wanted by hearing aid users. While standard rechargeable hearing aid batteries are common, Audéo B-R uses a lithium-ion battery – a first in the industry. Lithium-ion is usually used in laptops and smartphones. It’s the most promising battery technology around, providing 40% more power than traditional rechargeables. Phonak’s innovative use of lithium-ion has solved three common hearing aid problems. Changing batteries can be difficult, especially for people with dexterity issues. Audeó B-R’s battery is in-built, so there’s no battery door to open and no batteries to remove. Simply slip the hearing aids into the easy-to-handle charging station and your job is done. 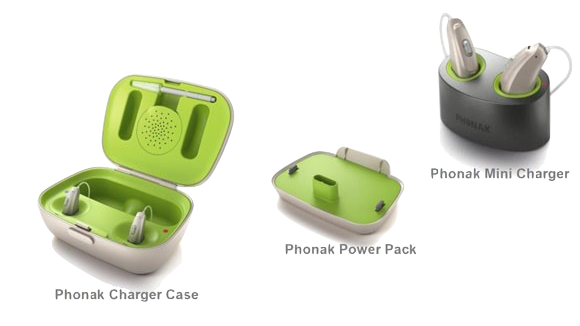 Phonak offer three flexible charging options. The standard hard-shell Charger Case doubles as a drying unit, to keep hearing aids well-protected and maintained. A Power Pack attaches to the Charger Case, ideal for weekends away where you have no access to a power source. The Mini Charger is a compact solution for places where you need a second charger. The batteries can withstand years of repeated charging and will last as long as the hearing aid does. You won’t have to buy or change a battery ever again. It’s also environmentally friendly – the average hearing aid user sends 100 batteries to the landfill every year. The new AutoSense OS is an intuitive automatic system that gives you better sound performance throughout your day. It analyzes your sound environment every 0.4 seconds, and uses adaptive technologies and features to instantaneously improve sound quality on-the-go. As a result, speech and hearing are optimized in every situation, such as while driving, in one-to-one conversations, or while listening to music. Features such as UltraZoom improve speech understanding in noisy environments by up to 60%. You won’t need to fiddle with settings or change programs unless you want to – all you have to do is turn your hearing aids on and AutoSense will do the rest. Phonak is committed to improving the lives of their customers, and has pioneered a groundbreaking new hearing aid that can keep up with busy lifestyles. Audéo B-R’s innovative battery and unparalleled sound quality offer users a cutting-edge hearing solution, and an effortless and exciting listening experience. Interested in trying the Audeó B-R? If you are interested in trying out the Audéo B-R, get in touch! Our hearing specialists will be happy to help.